This Baked Brie with Blueberry Sauce has summer written all over it! It’s perfect for a backyard barbecue in the middle of July. The sweetness of the blueberries marry very well with the brie. Where can you find a round of brie? More often than not, brie is sold in little wedges that you’ll find in the gourmet cheese aisle at your grocery store. That’s not what you need for this recipe. Sometimes you’ll be able to find rounds of brie in your grocery store too, but they’re usually kind of expensive at a regular grocery store. I suggest you look at Costco or Sam’s Club for an 8-inch round brie. Trader Joe’s might carry them too. That’s the perfect size for this recipe. 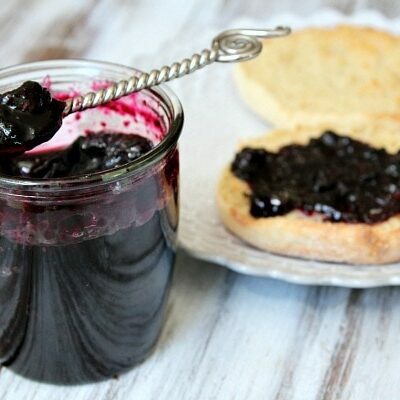 To make the blueberry sauce, fresh blueberries are simmered with brown sugar, shallots, cider vinegar, ginger, a touch of cinnamon and cornstarch to thicken. The blueberry mixture is then spooned on top of the warmed brie. Blueberries are abundant on the Northeast coast of the US. You can find them in the markets pretty easily on the west coast, but nothing beats the blueberries that you come across in New England. They’re BIG and juicy little buggers, and they’re cheap as can be. I created this recipe a few years ago, and I’m re-sharing it with you today. I was staying in a beach house in Massachusetts, where I got the inspiration for this recipe because of the inexpensive blueberries that I kept coming across at all of the summer farmer’s markets. Served up with crackers or baguette slices, this blueberry brie makes a terrific, summery appetizer. Every bit of this amazing dish will be gobbled up- brie scraped down to the rind and plate practically licked clean of any trace of blueberry. Guaranteed! If you’re looking for more summer appetizer recipes, you may with to try Bruschetta with Peach Salsa and Melted Brie or Strawberry Mango Salsa Cups. 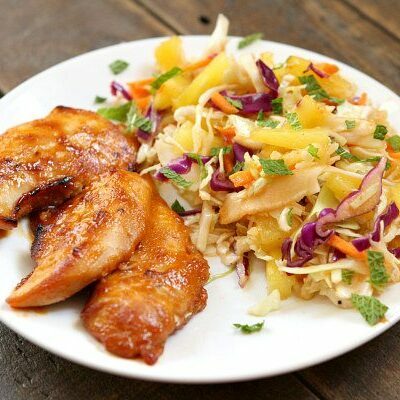 Grilled Blue Cheese and Pear Pizza or Glazed Chicken Sausage Pineapple Bites are good choices too! 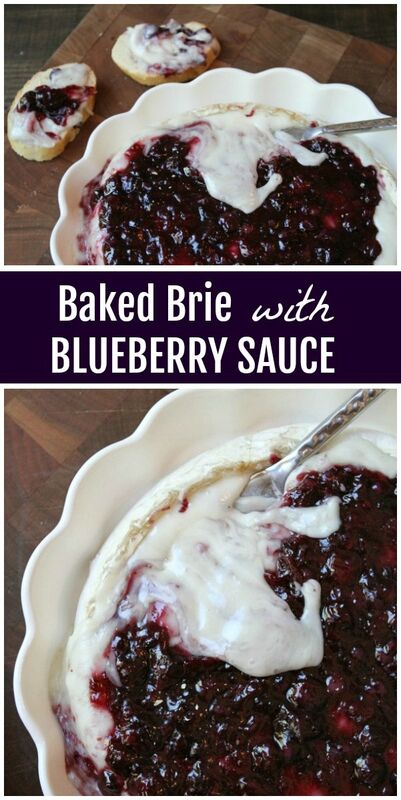 Watch the video showing you how to make Baked Brie with Blueberry Sauce, then scroll to the bottom of this post and print out the recipe so you can make it at home. 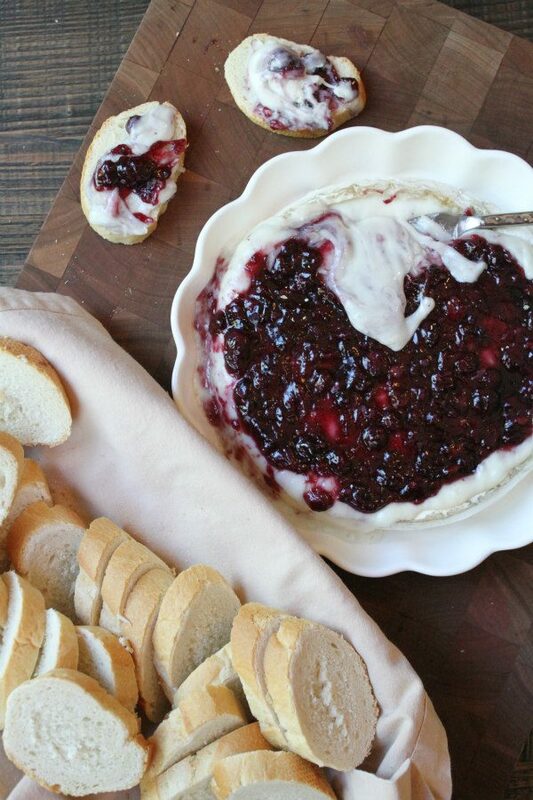 This melted brie is so delicious served with fresh blueberry sauce! Combine all ingredients (except brie) in a large saucepan. Bring to a boil over medium heat, and cook 2 minutes. Remove cinnamon stick. Cover and chill blueberry mixture until ready to use (or let sit, covered, at room temperature for up to one hour). Place brie round on baking sheet or in a baking dish. With a sharp knife, cut through rind around the top edge of the brie (just make a cut into the top layer of the brie all the way around, but don't remove it). Bake 15 minutes, or until cheese is soft and melted. Carefully move hot brie to a serving plate. With a sharp knife, carefully cut under the top of the brie (under the rind) and remove. Top the brie with the blueberry mixture, and serve with baguette slices or crackers. *If chilling the blueberry mixture, be sure to take it out of the refrigerator and let it lose some of its chill before placing it onto the hot brie. This sounds great – except I’m allergic to blueberries. What other fruit/berry might be used in this recipe? Try it with fresh peaches! Hi, I sooooo want to try this. Sounds yum! Liquids will come out naturally- and it will begin to boil. No other liquid additions are necessary. This looks and sounds so good. I definitely want to try this soon. thanks foor sharing. Rather then cutting off the top of the brie and thereby losing some cheese, I prefer to scrape the rind off a chilled wheel with a serrated knife. Works like a charm and no waste. 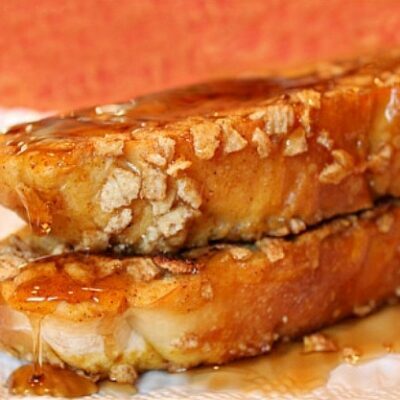 Thank you for posting this scrumptious recipe! I made it last night and decided to wrap the brie and blueberry sauce in pie dough and served with some sliced baguette. OH MY GOSH! I love ginger and dug the fact that it wasn’t overly sweet. Thank you again Lori.